An attaché case filled with items for study and travel make up Reliquary for a Fulbright Scholar. 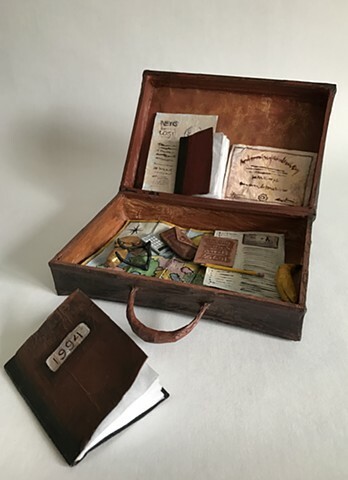 A map, a calculator, a banana, a certificate, books, journals, pencils, newsletters, glasses, and a golden idol, are the implements of a romantic adventurer attempting to trek in a post-colonial world. Enamored by exploration and discovery, this student of the world collects and travels with sacred objects of the journey.